The estimated 3D trajectory computed from the witness reports shows an shallow entry angle, one that could be associated with an Earth grazing fireball. But many witnesses reported a fragmentation – it could mean the meteoroid actually went through the Earth atmosphere. 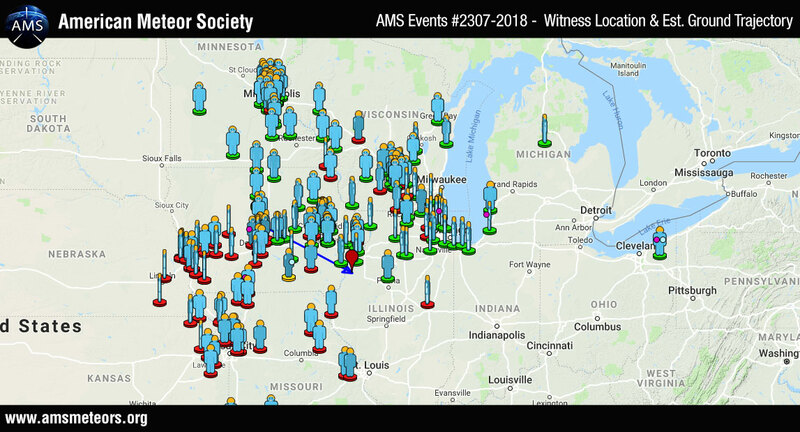 Witness Patricia K. (report 2307fd-2018) shared a security cam video of the flash produced by the event from West Farmington, OH. I saw this from our rural residence six miles due west of Monmouth Illinois. It was visible for almost ten seconds and was a beautiful gas flame blue color. I was photographing a cropduster and had my camera in hand with 300MM zoom and was so surprised I never thought to try to photograph it. Same here, all we could do is gape in awe. I saw it with my granddaughter in rural Atlantic, Iowa. I haven’t seen a video yet that does justice to the beautiful colors. We also saw an orange/pink halo around the coma during the last 8-10 seconds before it burned out. Fantastic experience to share with a loved one! Greetings, I’m in LaCrosse, WI and saw it for about 3 seconds low in the southern sky….fragmenting. I’ve only seen one other like this in my 58 years and it was truly wonderful! Same blue-green color you mention. Thanks! Hi, I just filled out a report and I forgot to mention in the comment field that I wasn’t sure of the exact time. It was after 8pm, and before 9 for sure. Just wanted to make it clear I was not precise on that! Thanks! Do we know what the exposure time on the Missouri video? There is definitely a secondary object in the upper right of the frame. Just wondering if it’s an airplane? We saw it from Peotone, Il. West sky moving north to south, guessing about 30deg angle from horizon, bright green with 2-3 piece separation before disappearing. Hi Mike, we saw this from Momence to Bradly/Bourbonnais also. We were on the 3,000 Rd.traveling east to west when we saw something blue green zip across the sky. There was only corn fields and a dusk sky so we didn’t know what it was until next morning when someone at work told me to look up fireball. I did a report. It was completely horizontal across the sky. So cool! I live in lees summit mo and my mother, my husband and I were sitting in the living watching a movie when my husband jumped up and ran the the sliding glass doors which face the north east a yelled “what is that”. Scared my mom and I. He said a missle just flew across the sky. Of course we just laughed at him. The trail of witness reports would not have stopped there if it passed through. Based on the trajectory as seen from here in Cest Falls, I believe it most certainly hit the Earth. But I’m no astronomer. I too witnessed this from Caledonia, Missouri while driving North on 21 Highway last night it was traveling from West to East and I saw at least one debris come off of it before it dissipated. 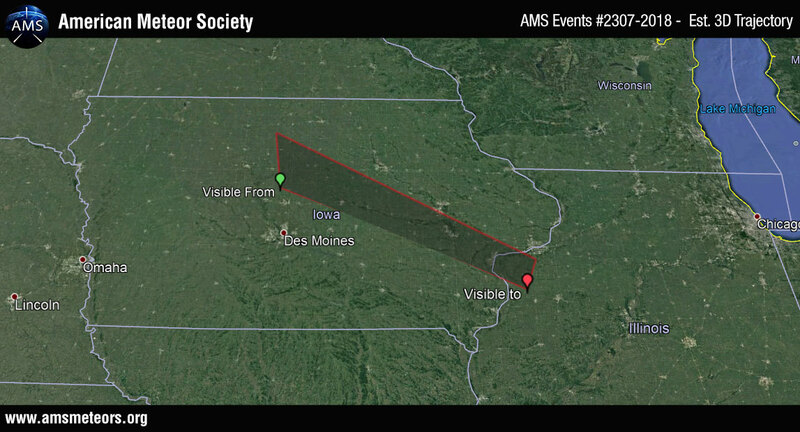 That’s what we witnessed outside of Atlantic, Iowa. My son saw it just south of Pekin while fishing on Illinois River. He described the event and said he could hear the whoosh and as it broke up the fizzle as it burned through the atmosphere. I reported this thing on AMS from Carl Junction, Missouri, but may have done something wrong because I don’t see my report. It was incredible to see it in the twilight. It was still very bright and this meteor had a light blue cast. While driving westbound on I-94 in Michigan (approximately at mile marker 37) on Sunday, 2018-07-08 at approximately 9:40 PM EDT, I witnessed an absolutely gorgeous fireball streak low near the western horizon. The fireball was slow moving, going north to south, and it was a beautiful greenish-blue on the outside and bright white near the center. It covered the entire span from one side of my front windshield to the other (guesstimate, a 60 degree span). It had a tail that was approximately 5 degrees long. The fireball itself was maybe 5 degrees above the horizon. Just before it winked out, it looked like it broke up into several smaller pieces. I seent it, it was green! I was looking into the sky off in the south from Edina, Minnesota! I saw this amazing event as well in Stillwater, MN! Pretty much like what everyone is already reporting, blue/green, bright, long tail, pretty cool! My wife and I were westbound on I-80 . The sun had set, but it was still twilight. We were just west of Geneseo, IL. We saw the meteor shoot from right to left with a bluish white hot trail following it. It got about 3/4 of the way across the sky to the left,and then just fizzled out. Much faster and brighter than any plane! It also didn’t lose any trajectory and it flew across as straight as an arrow! I was about thirty miles SW of you. 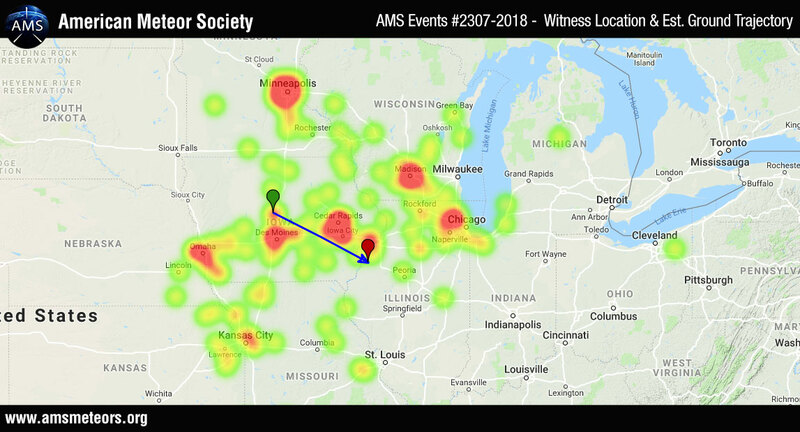 I have noted some differences in what color the fireball appeared to different witnesses. I don’t know if vantage point makes a difference but I saw something very similar. My first thought apon seeing this was what a beautiful “gas flame” blue it was. I was on Delta Flight 2214 from MSP to JFK. My girlfriend saw it first. She was looking out the window, and had enough time to tell me to look out. It looked like it was going laterally to us. We were at about 34000 feet over Sparta WI, or so the “flight tracker” on the chair said. It looked like the glint of another airplane in the sunset, but the sun wasn’t bright enough at the time to do that like I’ve seen in the past. She, too, saw the bluish-ness of it and saw a big piece break off. Yes, we reported it into the app…. I was fishing a local farm pond in south central Iowa (Guthrie co) facing east and noticed it around 8:30 pm. A few minutes later I heard a strange load boom as if a bomb went off. My wife and I both saw the meteor from n695 Hopkins rd, Arlington wi on Sunday night at about 8:40. We were driving on WI Hwy 51 southbound. She saw it first low on the western horizon, then I saw it. She might have seen it for 2-3 seconds and me for Maybe 1 second. Looked like a light blue flame with sparks behind it. We decided it was way too fast for a jet plane. (We are near a military jet base) and i thought a shooting star, but it was low and horizontal I the western sky. It looked like it was maybe 20 miles away, not 200. :). I was not able to report this on the website due to tech difficulties. We saw it with friends while boating and waiting for sunset on Lake Nehai in MO. Spectacular! I was driving Westbound around 8:35pm – 8:40pm., Carol Stream, IL. when a green, blue colored ball screamed across the sky along the horizon from as it appeared coming from the North maybe Northwest to the South / South East, amazing flares were trailing off the object as it screamed by. Saw in Rochester MN right before 9pm. Saw it in Lincoln, NE due east. Very cool! I saw it in St.Paul, MN. The remarkable things to me were how bright, neon green it was, and how long and slow the path seemed to be. My husband and I saw it Sunday July 8th at 8:38 pm in East Bethel Minnesota on our way home. It was super fast and bright green!! We we’re boating at Smithville Lake, Mo with family and saw green light streaking Eastward to our north. Beautiful! Did not report on website. Was Moline Illinois 6 days go saw this as i was leaving john deer headquarters. We saw this while driving north on Hwy 13 south of Clinton, MO. It was a brilliant, green fire ball. It looked a lot closer than indicated by the trajectory map. Must have been pretty big!